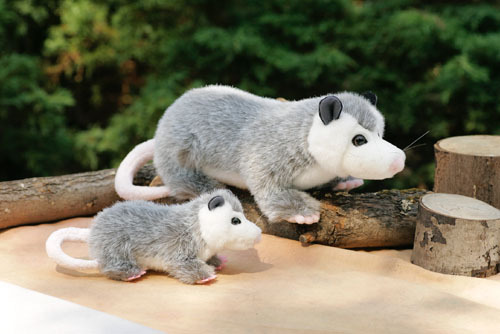 Opossums are only found in the Western Hemisphere and belong to the Marsupial family. Their eight or nine surviving babies in a litter are less than a half inch long when they are born. They are kept in their mother's pouch for the first two months, until they can climb out onto her back. They have pink snouts, pink claws, a pink prehensile tail and very sharp teeth. Their diet consists of insects, grubs, vegetables and any meat or fish they can find, usually carrion. Theya re nocturnal and will scavange for food at night. Opossums are able tree climbers and they can use their tail to balance and to wrap around branches for stability, as well as to gather twigs for their burrows. When an opossum is threatened, they will flash their sharp teeth or they will roll over and "play dead", which has given rise to the expression "playing possum".